After their first foray into directing with Cloudy with a Chance of Meatballs proved to be a rousing success, directors Phil Lord and Chris Miller took an unexpected turn, jumping into R-rated comedy territory with a reboot of the hit 80s show 21 Jump Street, one of the best surprises of last year. For their next project, they’ve returned to the field of animation and will be taking on a property nearly everyone in the world is familiar with: LEGOs. Chances are you’ve at least put two and two together as a child (or adult) and now they are coming to the big screen. While we have yet to see any sort of still or piece of footage related to the film, we know that Chris Pratt, Will Ferrell, Elizabeth Banks, Liam Neeson, Will Arnett, Nick Offerman, Alison Brie and Morgan Freeman will all be providing voices. Now Warner Bros. have delivered a new title logo, which confirms the movie is officially titled The LEGO Movie (and not rumored titles of LEGO: The Movie or LEGO: The Piece of Resistance). Make sure to click it below to see the detail, then scroll down below for information on a contest that could have you headed to WB’s studios. Beginning March 25, LEGO fans registered worldwide on ReBrick.com will have a one-of-a-kind, hands-on opportunity to take part in the growing excitement for The LEGO Movie by creating a 15-30 second video clip based on its story, in the “LEGO ReBrick Movie Competition.” The winning video could be featured in the film, the first-ever, full-length theatrical LEGO adventure, from Warner Bros. Pictures and Village Roadshow Pictures, opening February 7, 2014. Using only LEGO bricks and non-licensed LEGO minifigures, contestants will select a character and set their action sequence in one of their favorite LEGO worlds, such as LEGO City, Space, Pirates, Western, Vikings, Dino, Castle, and others. After building and recording their LEGO designs, they will upload the video to YouTube, and bookmark it on the ReBrick.com Building Challenge page, where it will be open for voting from the entire ReBrick membership. The 25 videos earning the most “Likes” will ultimately be reviewed for creativity, originality, theme and suitability for the film by a panel of judges, including Phil Lord and Christopher Miller, writers/directors of The LEGO Movie. The Grand Prize winner will receive a trip for two to Warner Bros. Studios in Burbank, California, for a VIP Tour; a meeting with the directors, to participate in a LEGO build; an exclusive LEGO film camera designed and built by the official LEGO model shop; plus souvenir items from the movie’s set, signed by the designers. His or her winning entry may also be edited into the film’s big battle sequence. Second and third place winners will also be honored, as well as winners of bi-weekly prizes selected during the challenge’s six-week run, for a range of additional prizes, including tickets to the Studio’s tour, The LEGO Movie merchandise, a $200 gift card for the Studio’s online store, and a feature spot on The Official LEGO Channel on YouTube. Local regulations and complete prizing information can be found on the Contest Rules page, with additional guidelines, examples and updates available at microsite ReBrick.it/LEGOMovie. Winners will be announced on May 20, 2013. 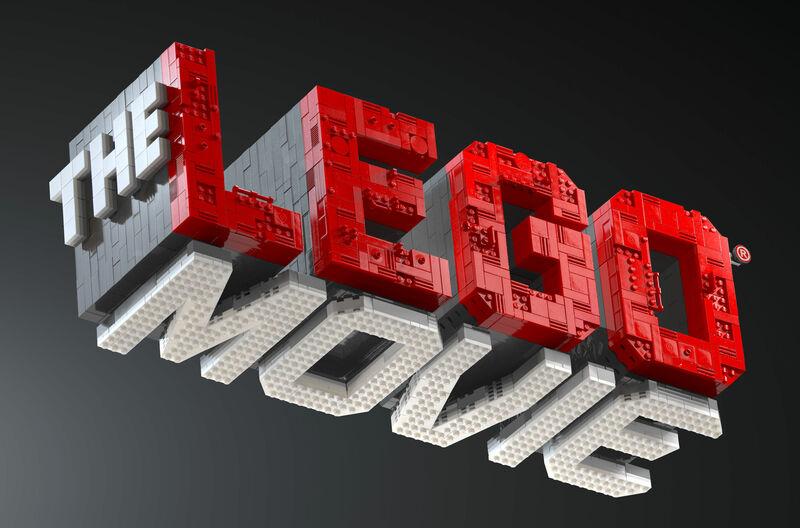 The LEGO Movie, for which you can see the new title treatment above (click it for a larger version), opens in theaters February 7, 2014. The 3D computer animated adventure tells the story of Emmet, an ordinary, rules-following, perfectly average LEGO minifigure who is mistakenly identified as the most extraordinary person and the key to saving the world. He is drafted into a fellowship of strangers on an epic quest to stop an evil tyrant, a journey for which Emmet is hopelessly and hilariously underprepared. The LEGO Movie stars Chris Pratt, Will Ferrell, Elizabeth Banks, Liam Neeson, Will Arnett, Nick Offerman, Alison Brie and Morgan Freeman as the voices of the animated characters. The film is directed by Phil Lord & Christopher Miller (21 Jump Street, Cloudy with a Chance of Meatballs) from their original screenplay, and story by Dan Hageman & Kevin Hageman and Phil Lord & Christopher Miller, based on LEGO construction toys. It will incorporate some of the LEGO world’s most popular figures while introducing several new characters, inviting fans who have enjoyed the brand’s innovative toys and hugely popular video games for generations to experience their visually unique LEGO world as never seen before. The film will be produced by Dan Lin (Sherlock Holmes, Sherlock Holmes: A Game of Shadows) and Roy Lee (The Departed, How to Train Your Dragon). Are you looking forward to The Lego Movie?